“Mary Magdalene Announcing the Resurrection, St. Alban’s Psalter, 12th c.
The Gospel has had a good run on television this year. Maybe this happens every year, but it seems like there are even more specials this year aimed at Christians. There is “Biblical Conspiracies,” “Secrets of the Bible,” “Killing Jesus,” “Finding Jesus: Fake, Fact, Forgery,” and then the very glitzy, “A.D. The Bible Continues.” Casting the Argentinian actor Juan Pablo Di Pace as Jesus raises a good question: Though he’s nice to look at, is that how we imagine Jesus? How do YOU perceive Jesus? We might understand him as a kind of vague character who somehow manages to survive layers of projections, from the blond Jesus of Sunday school books, through the art of the Renaissance, to the Hollywood action figure of Scorsese’s “Last Temptation of Christ” or Mel Gibson’s “Passion of the Christ.” Maybe you relate to the practical, real-world Jesus met in contemporary books like Bob Briner’s The Management Methods of Jesus: Ancient Wisdom for Modern Business. Tricia Gates Brown talks about her journey from a fundamentalist background in “Jesus Loves Women: A Memoir of Body and Spirit.” Dan Horan, OFM, is a Franciscan friar who entitles his blog, “Dating God,” suggesting that our relationship with Jesus can be like catching up over coffee, or going for a run in the park. How do we think of the resurrected Jesus? My understanding of Jesus has changed as I’ve grown older, as I’ve experienced more of life, as I’ve undergone challenges and changes. I would guess your understanding of Jesus is different now than it was in the past or might be in the future. The Holy Spirit is a spirit of change, burning away the old to make room for the new, so it shouldn’t surprise us that our images of God ebb and flow, at times being sharp and clear, and at others being cloudy and opaque. My sense of Christ’s presence comes from scripture, from the sacraments, and from my experience of Christian community, but today’s Gospel points to a particular image that is an important one, I think. It’s an image of the risen Christ that can stay with us through all the changes and chances of life. Mary Magdalene goes to the tomb where Jesus was buried and she finds it empty. She sees a person she thinks is the gardener and she begins to talk with him. When he says her name, she sees that it is Jesus – her friend, her leader, her Lord, perhaps more—but above all, her Rabbouni. “Rabbouni” is a term of respect, a little like “Lord,” or “chief,” but John the Evangelist makes it clear that Mary means “teacher.” Jesus is her teacher, above all else. This isn’t all that surprising from what we know about Jesus from the Gospels. The story of Jesus in the temple, illustrated in one of our stained glass windows in the north end of the choir, shows a precocious Jesus being quizzed by the elders at the temple. Or perhaps he was quizzing them. Jesus’s earthly ministry was spent teaching. He summarized sections of the Hebrew Scriptures and updated them with stories and illustrations. The Sermon on the Mount is regarded as one of his greatest teachings. We’re told that “the crowds were amazed at [Jesus’s] teaching; for he was teaching them as one having authority, and not as their scribes” (Matthew 7:29). Jesus seemed to speak not only to the head, but also to the heart, as though he was speaking right into your soul. Jesus taught in his earthly ministry, and at the tomb after the Resurrection, Mary Magdalene shows us that Jesus continues to teach. As she recognized him as teacher, she also seems to have found her own voice for teaching. After all, it was Mary Magdalene who then went and told the other disciples that Jesus had risen. Because of this she’s regarded as the first evangelist, the first preacher, the apostolorum apostola (apostle of the apostles). 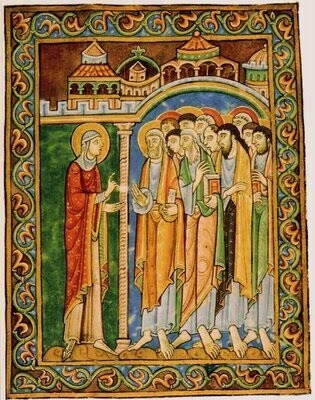 Images of Mary Magdalene preaching were popular in medieval art and theology, and The 12th Century St. Alban’s Psalter shows an image of her preaching the Good News, the student of Jesus who is now the teacher. “Blessed Lord, who caused all holy Scriptures to be written for our learning: Grant us so to hear them, read, mark, learn, and inwardly digest them, that we may embrace and ever hold fast the blessed hope of everlasting life” (Collect for Proper 28). Hear, read, mark, learn, and digest. That’s how Jesus continues to teach us. We certainly hear scripture in church. Those of us who follow Daily Prayer in person or online hear scripture. If you come to church, you’ll hear scripture. We hear a lot of scripture. Sometimes we simply let it was over us and probably couldn’t tell someone what we just heard. But other times, we hear a word or a phrase that stays with us or feels like it’s directed right to us. It sustains, or judges, or soothes. It teaches. We read scripture in church, but most of us probably don’t read much out of church. We could learn more, if we did. There are Study Bibles that guide readings. There are devotional booklets that suggest topics. There are commentaries and all kinds of things to help us read better, and to help us learn. “To mark” the Word we hear and read might mean literally to mark, to highlight or underline, but it also means to notice, to make a mental note—“Oh, I should remember that Psalm when I’m feeling afraid,” or “ Oh right, I should remember what Paul says about such-and-such the next time I see my neighbor. Marking is a part of learning. To inwardly digest the Word of God might mean to memorize a phrase, sentence, or passage of scripture. It might mean to meditate on the scripture. Lectio divina, is a way of reading the same passage of scripture several times, often three times. But there’s a pause after each time to notice what stands out, to hear, basically to learn. Mary Magdalene learned from the stories of Jesus, but also from her relationship with him. We can learn from him through scripture, through prayer, through his presence in the Eucharist, and in the Body of Christ which is the Church. Christ is certainly many things to many different people, but Christ the Teacher is an aspect of God that helps us with day-to-day living, with problems, with relationships, with work, with everything. One of the most popular icons of Jesus is as Christ the Teacher. In this icon, he one hand is held in the gesture of blessing or peace, and the other is holding a book, usually an open book. The open book invites us in. Whether we experience Christ primarily as friend, or brother; mostly as leader or God-with-us, may Mary Magdalene help us know Rabbouni, Christ the Teacher, “that we may embrace and ever hold fast the blessed hope of everlasting life” and know the fullness of the Resurrection.